Diary of a Short Woman » Blog Archive » Shapeshifters Galore! Two new stories up, and they’re related even! 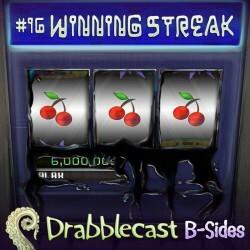 “Winning Streak” is up at Drabblecast and “The Aubergine Wok” is up at Comets and Criminals. Go team shapeshifter! An interesting or not so interesting aside, The Aubergine Wok’s title came about when I decided to use Google voice search to look up René Auberjonois on my phone. Needless to say, I got some quite imaginative search results, including “Aubergine Wok.” So I had a title and no story, and it seemed like a natural fit to bring my old shapeshifter friend into the mix. Hopefully we will be seeing more of Traleel’s adventures soon!